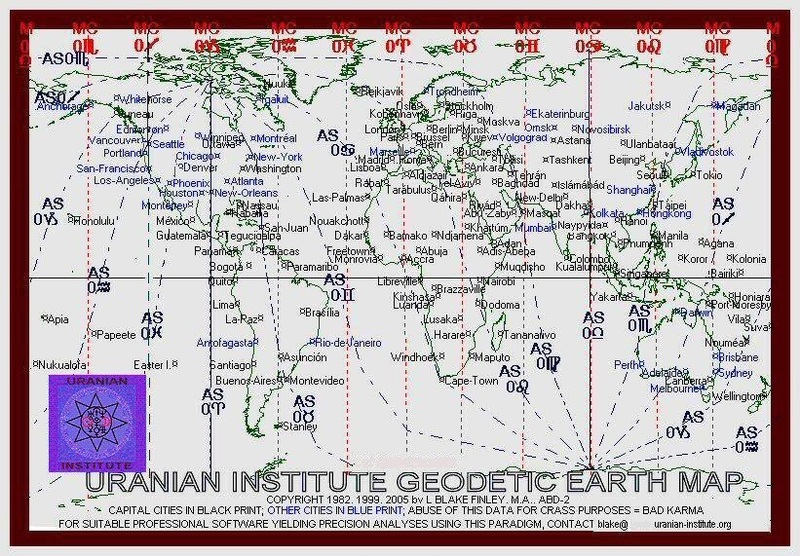 Manual production of both a Geodetic globe and a small Geodetic Atlas with individual maps of each continent showing both MC and Ascendant lines were developed after extensive and tedious manual calculations by Blake Finley in 1982. According to Blake's mentor at that time, Iaen Sullivan, the atlas was stolen from his office by Texas-born astrologer "Bob/Robert Campbell" (b. Fort-Worth TX 1948, Sai Baba "devotee") later that same year and presented at an NCGR Conference in late 1983 or early 1984. Chris McRae of Alberta informed me that she developed a similar map with Ascendant lines and presented it at a conference in Virginia in 1977, which I was not aware of until 2005, and published a book on how to construct the map in 1988. Ms McRae also produces a full-size wall-map to hang on your wall... for further information see http://www.astrologychrismcrae.com/ You are welcome to copy the map shown above for your reference. The original inspiration for this map came primarily from the work of Ruth Brummund, published in German in 1979, that of Joyce Wehrman published in the early 1980s, and that of Harry Suthann, who produced such a map without Ascendant lines in the 1930s (published in the National Astrological Journal in 1934 and 1935).